The Taunton Press , located in Newtown, Connecticut, needed a very flexible dust control system for two adjacent woodshops in their newest 40,000 sq. ft. facility. One woodshop is a testing facility and photo studio for new machinery for Fine Woodworking (35’x42′). 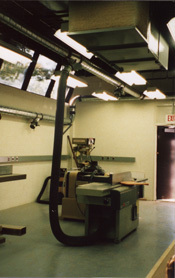 The second woodshop is a fully operational facility for the editors (35’x18′). Curt Corum, Sales Manager for Air Handling Systems designed a special system to meet their unique dust control needs. Paul Roman, Chairman of The Taunton Press, wanted a “flexible system.” He wanted each room to have the utmost degree of flexibility. A total of 19 lateral branches (pick up points) between the two rooms were needed to meet Mr. Romans requirements. Each branch contains a 5-inch blastgate and female portion of a quick flexhose disconnect (QFD). Several hose assemblies contain a male portion of the quick flexhose disconnect which can be quickly attached to the female portion. To complete the system, Curt recommended a Delta two-stage 7 Â½ HP dust collector be used. This made for a completely diverse system. The editor’s shop has 10 pick up points where they can plug in the hose attachments. The larger testing facility and photo studio has 9 pick up points to plug in the hose attachments. Full coverage of each shop was provided as a result of this plan. Curt gave Mr. Roman and his editorial staff two choices for the quick disconnect system. The first choice was a new product, we have just developed, the Quick Flexhose Disconnect (QFD). This new disconnect has been designed by our own staff and provides for a quick and easy way to connect and disconnect flexhose from attachments. The second choice was an older system we have sold for years. Mr. Roman and his staff chose our new QFD. This was the first time it was used in the field. Needless to say, they are very happy with this new product. This system was installed by the professionals from Edgerton, Inc., Monroe, Connecticut. They are mechanical contractors, experienced in the installation of dust control systems. Because of noise and limited floor space in the shop, a separate room was built outside adjacent to the shop to house the dust collector (see photo). A return air grill with a filter was located in the common wall of the shop and collector room. This allows air to recirculate back into the shop. This was done to conserve on heat and air conditioning and to avoid a minus pressure problem. Finally, to capture any fine flotation dust not collected by the system, Curt recommended that they purchase and install a self-contained ceiling suspended air filtration device in each room.